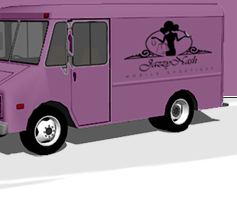 JazzyNash is Nashville's first mobile shoe boutique offering women a unique shopping experience for the latest trends in shoes and accessories. We will feature some of the newest designers as well as offer custom handmade jewelry pieces. Follow us to see where we will be next or contact us directly for your private shopping party or corporate event. Jasmine, a native of Chicago Illinois settled in Nashville in 2002 after graduating from Fisk University. Her background in corporate America includes inside sales, sales management and operations in the technology industry. Jasmine proposed the idea of opening a “shoe truck” to one of her college best friends and fashion buddy Samaki Nash after watching a reality show. Jasmine has a huge love for shoes, something she shares in common with Samaki. Jasmine aspires to combine her background and love for shoes along with Samaki’s professional background and sharp eye for the hottest trends and love for accessories to make JazzyNash a premier shopping experience for young professional women and college students. Samaki is a native of St. Louis, MO. She settled in Nashville, TN in 2004. She also attended Fisk University as well Lindenwood University for post-graduate studies. Samaki has a background in healthcare and has experience in customer service, management, and operations. When she was approached with the idea of a shoe truck by her good friend Jasmine, she was super excited because her passion has always been fashion. She has spent countless hours looking at the latest trends in magazines and online and making fashion suggestions to her close friends and family. Samaki desires to combine her knowledge and love for unique trends in shoes and accessories with Jasmine’s professional background and love for fashion to make JazzyNash a unique and edgy shopping experience for the women in Nashville, TN and surrounding areas.